Other than Comcast, there are few companies I don’t think I couldn’t turn around for $12 billion and Cadillac isn’t so bad, really. There’s a lot of work that needs to be done, but it’s all doable. I throw that out there because Johan de Nysschen apparently needed proof that GM was serious about making a run at the luxury market and that $12 billion was a big point of persuasion. De Nysschen spent hours on the phone with GM President Dan Ammann to make sure this was no vanity project. 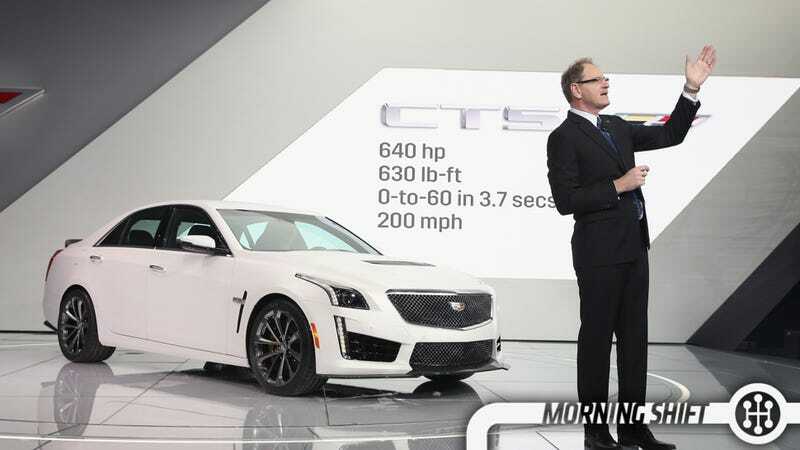 The clincher: GM agreed to invest heavily in Cadillac, eventually budgeting $12 billion for the next five years, or more than a quarter of the sum being spent on new models companywide. Ammann & Co. also pledged to give de Nysschen enough time and people to get the job done as part of a plan to split Cadillac into a company that’s now based in New York. GM is counting on Cadillac to drive profits in the next decade. Luxury cars make up just 10 percent of the 100 million cars sold globally every year but haul in 50 percent of the profits. GM will be less able to rely on fat truck margins to keep it solidly in the black because tightening fuel economy standards in the U.S. could push up production costs. They’ll be having a party in Brooklyn tonight to unveil the CT6, which says as much about Cadillac as it does about Brooklyn. Supporters of TPP have said it will open new markets for U.S. products, helping bolster U.S. manufacturing and job growth. Opponents have argued that there should be no fast track process and that the government should openly debate the matter, fearing that the partnership could encourage job outsourcing and unfair working conditions. They aren’t alone, as Michael Wayland points out, with Ford also complaining that countries in the proposed trade zone (ahem, Japan) are manipulating their currency to drive down export costs. It’s true. I hate paper. As a Millennial I constantly read and am in constant contact with everyone I know all the time, but I would rather text someone than talk to them on the phone or send them an email than leave them a note. This feeling apparently applies to dealerships as well, at least according to a new AutoTrader study. As the Freep reports, Millennial buyers are basically like Great Depressions survivors in that they’re extremely budget conscious and concerned about getting a good deal, but they’re also Gen X impatient with unnecessary delays. Overwhelmingly, consumers don’t like the current car-buying process, especially the 4-6 hours it takes to complete the transaction at the end, including an hour just for the credit check, said Jared Rowe, president of AutoTrader. But that does not mean they want to excise the dealership out of the equation. In fact, 84% said they want to buy their car in person and women and young buyers are the most adamant about coming in to see, touch and experience the vehicle they have spent so much time researching and which they will spend many years owning. Cheap and easy credit will continue to support car sales, or at least that’s what the National Automobile Dealers Association thinks based on their read of the Fed’s read of sluggish economic growth in the first quarter of this year. NADA’s chief economist told a conference call yesterday that auto sales will likely increase again this year even if March is down slightly. Get that new car while you can, I suppose. China hasn’t worked out as well for Tesla as Elon Musk would have liked, with Musk admitting they made mistakes there, but he’s overall positive about the company’s prospects there. And because everything Musk says is analyzed and hyped as much as Game Of Thrones trailers, the stock price saw a nice boost to $190.60 to end the day, as Reuters points out. I think the Model X could be a hit in China, whenever it makes it there. On this day in 1931, Knute Rockne, the legendary Notre Dame football coach and namesake of the Studebaker Rockne line of autos, is killed in a plane crash near Bazaar, Kansas, at the age of 43. Neutral: How Much Would You Spend Fixing Caddy?